This Learning Series provides tourism education resource materials that are current, visually appealing and fun to use. Additionally, these audiovisual materials allow students the opportunity to focus on their country and the wider Caribbean, view their country and the region through the eyes of the visitors and take pride in what the region has to offer as tourism destinations. 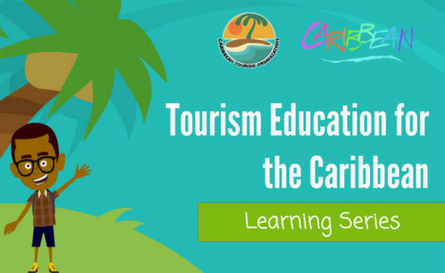 To develop a greater awareness of tourism in students at all levels in primary schools in the Caribbean. To allow for the promotion and protection of the Caribbean’s identity and develop in its youth a sense of pride and confidence in projecting the unique image of the Caribbean. To give primary school students an opportunity to fully appreciate and enjoy all the various facets of the Caribbean tourism product, including its people. To create national awareness of the value of tourism and to give status to tourism education in the primary schools across the region. *Pay Offline: Contact Marvelle Sealy ([email protected]) or call 1-246-427-5242 to place your order. You’ll be sent details on how to access the product when payment is complete. Details will be sent after purchase. Contact Marvelle Sealy ([email protected]) if you have questions about the series. Telephone: 1-246-427-5242.